The 645 AF is a medium format SLR camera made in Japan by Mamiya, the company's first auto-focus camera. It was released in Japan in September 1999. 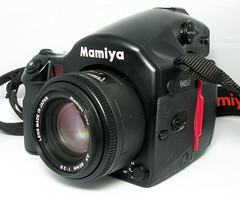 It was followed in December 2001 by the 645 AFD, a version of the same camera made compatible with some digital backs (not produced by Mamiya at the time), and Mamiya produced improved models, the 645 AFDII and 645 AFDIII later. These retain the ability to use either film or a digital back, switching from one to the other quickly, mid-roll if desired. The cameras have a new bayonet lens mount incorporating several electrical contacts, to support the use of AF lenses. The range of lens designations is very similar to that provided for the earlier, manual-focus cameras (the Mamiya M645 and M645 Super/Pro series cameras). Whereas the M645 Super/Pro series cameras had polycarbonate bodies, the 645 AF series have aluminium bodies. 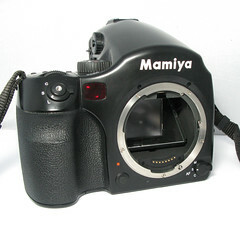 Perhaps Mamiya was sensitive to criticism of the previous, plastic body; the introduction of the manual for the AF uses the phrase 'heavy professional use' a number of times. Many of the features of the 645 AF are retained from Mamiya's previous series of 4.5x6cm SLR cameras (the M645 Super and related models). However, the camera is not built in the modular way that those cameras were; the power film winder is built-in, as is the AE prism viewfinder; a waist-level finder cannot be used (although there is a right-angle eyepiece attachment). The standard lens is an 80 mm f/2.8, as in the pictures. As in previous camera series, the prism finder has settings for spot (S) or center-weighted average (A) metering, and a setting (A-S) in which the camera automatically selects one or other of these, or an exposure between the two, based on the variation in brightness in the scene. The meter measures between EV 2 (1/2 second at f/2.8) and EV 19 (1/1000 second at f/22) at ISO 100, and allows exposure compensation by up to three stops in either direction; any selected compensation is shown in the VF display. The viewfinder eyepiece has a shutter to keep out light when the camera is used away from the eye, and built-in diotric adjustment. Exposure settings are controlled via menu options displayed in an LCD on top of the winder grip, and selected with wheel controls (one by the shutter release button, and another at the back of the grip, by the user's thumb) in combination with a main mode dial. The exposure settings in use are also displayed at the bottom of the viewfinder. The mode dial has settings for programmed AE (P), aperture-priority (Av) and shutter-speed priority (Tv) AE, metered manual exposure (M), auto flash (X) and a setting for long exposures (T). The dial locks in the 'X' mode; there is a lock-release button in the centre of the dial which must be pressed to move it from 'X' to any other mode. Programmed AE ('P'). In this mode the camera selects both the shutter speed and aperture according to a programmed profile (that is, for any EV level, this mode offers a single combination of shutter speed and aperture; for example, at EV 12, 'P' mode gives 1/125 second at f/5.6). It is possible to shift the program profile to favour a shutter speed one stop lower, with a correspondingly smaller aperture giving the same EV (sub-mode PL, giving in the example above 1/60 second at f/8), or a higher speed and wider aperture (sub-mode PH, in the example case giving 1/250 second at f/4). These 'program shift' sub-modes are selected with either the front or rear wheel controls. Aperture-priority AE ('AV'). In this mode, either wheel control is used to adjust the aperture, in half-stop increments. The LCD shows both the aperture and the shutter speed (or a flash symbol if the light cannot be metered at the selected aperture). Shutter-priority AE ('TV'). In this mode the wheel controls are used to select the shutter speed, in half-stop increments. The LCD shows the speed and aperture; the aperture flashes if the light is too dim to meter at the selected shutter speed. Metered manual ('M'). In this mode the front wheel control selects the shutter speed, and the rear control the aperture. Both are shown in the LCD. If the meter reading differs from the set values, the 'error' is shown at the right hand side of the viewfinder display, as the number of EV stops (up to ±6), in steps of one third of a stop (that is, if the VF display shows '+1.3', the current settings will give one and one third of a stop over-exposure, relative to the meter reading). Flash ('X'). In this mode the shutter speed is fixed at 1/125 second. Time ('T'). This mode allows 'T' shutter mode for very long exposures, where the shutter release is pressed once to open the shutter, and again to close it. In this mode, the shutter is mechanically controlled, so that the batteries are not drained by prolonged operation of the electronic shutter mechanism. There is an AE lock button ('AEL') by the rear wheel control, allowing the user to reframe the scene after metering, in any of the AE modes. This is also useful to allow the AE modes to be used with the mirror-up control. The wheel controls can be locked, using the 'F1' and 'SET' buttons by the LCD, to prevent accidental adjustment of the exposure settings in the AV, TV and M modes. Exposure bracketing. In the P, TV and AV modes, exposure bracketing is available, selected by pressing the 'Mode' button by the Mode dial, once. The bracket can be adjusted to half, two-thirds or a whole stop, using either of the wheel controls. Multiple exposure. The camera can be set to make up to five exposures before advancing the film. This facility is also selected by pressing the 'Mode' button twice, and the number of exposures on one frame adjusted with the wheel controls. Self-timer. The self-timer is selected by pressing the 'Mode' button three times, and can be adjusted between 3 and 60 seconds, using either of the wheel controls. The camera has a focal-plane shutter with aluminium blinds that travel vertically. This gives speeds from 30 seconds to 1/4000 second, in steps of one-eighth of a stop when in AE, or half a stop when manually set. 'B' is available as a shutter speed in the 'M' mode, and there is a mechanically-controlled 'T' mode for very long exposures, as noted above. The shutter synchronises for flash at 1/125 second. Both shutter blinds are automatically retracted (i.e. the shutter opens) when the film back is removed (to avoid damage to them) or when there are no batteries in the camera. The shutter release button has settings for single or continuous exposures, and a locked position. It is threaded for a standard cable release. There is also a socket on the left side of the body for electronic releases, including remote ones. Single-focus ('S'). In this mode, when the shutter release is half-pressed, the camera focuses, using the area in the small rectangle marked across the centre of the VF. When satisfactory focus is achieved, the focus is fixed (i.e. the camera stops adjusting it), and the focus marker in the VF display lights. The shutter will not release until the marker has lit. Mamiya also describe this mode as focus priority, and suitable for still subjects. The fixed focus is cancelled if pressure is removed from the release button. This mode allows the familiar method in which the scane may be reframed after focusing, while holding the shutter release button down, to place the focused subject off-centre in the frame. Continuous focus ('C'). In this mode, when the release button is half-pressed, the camera continuously adjusts the focus as the scene is reframed by the user. The focus mark lights when the current scene has been focused, but the shutter may be released at any time. Mamiya describe this mode as release priority, and suitable for moving subjects. Manual focus ('M'). In this mode, focusing is done by the user with the lens' focus ring. The VF shows focus guidance arrows in addition to the focus marker (these only work with lenses of f/5.6 or wider). The camera has an infra-red lamp on the front of the body, next to the shutter release. This lights to illuminate the subject in conditions of dim light or low subject contrast in the Single focus mode, to assist the auto-focus function. There is a depth-of-field preview button on the bottom right of the front of the body. The 120 film back for the 645 AF is superficially similar to that for the earlier M645 Super; it is a detachable chamber, with a metal dark slide, into which a film insert (comprising a pair of spool-holders with a pressure plate and rollers) can be fitted. However, the back for the 645 AF has an LCD and 'up' and 'down' buttons to set and display the film type and speed (between ISO 25 and 6400), and requires its own battery (CR2032) to support this while the back is detached from the camera. It also has more electrical contacts than the earlier film back, and the two are not interchangeable. The same film insert accepts both 120 and 220 roll film; the pressure plate may be rotated, to adjust it for the different thickness of 120 and 220 film. The back automatically advances the film to frame 1 provided the paper leader is attached to the take-up spool. A Polaroid back also exists. The dark slide cannot be opened when the back is off the camera. The back cannot be detached when the dark slide is out. The shutter cannot be released when the dark slide is in. As with earlier models, the camera has a ⅜-inch tripod socket with an insert to adjust it to ¼-inch size. There is a mirror-up lever on the left-hand side of the body. There is a hot shoe on top of the prism, as well as a PC socket on the left side. The camera is compatible with some Metz flashes for through-the-lens flash metering, with an adapter. There is a backlight for the LCD, switched on with the 'BL' button. The camera has a built-in facility to imprint date and/or serial number data at the edge of each exposure. This is controlled with the 'F1', 'F2' and 'SET' buttons by the LCD. The camera requires six AA alkaline or lithium batteries, which are loaded in a removable holder that fits into the grip. The LCD display shows the battery condition continuously when the camera is switched on (i.e. when the shutter release is not in the locked position). 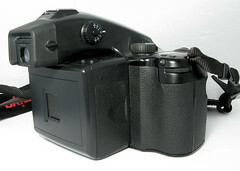 An external battery holder exists (to be kept in a pocket, for cold-weather use); this connects to a socket in the base of the camera. 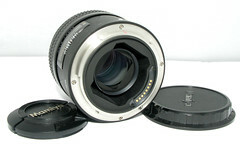 The standard lens is an 80 mm f/2.8, as shown on the examples pictured. As at autumn 2008, the list of lenses available was as follows. The range of designations is very similar to that provided for earlier generations of Mamiya 4.5×6cm SLRs, except for the addition of the 28mm. The lenses attach on the AF bayonet mount in the same way as with the previous mount, by aligning the lens with the red spot on the body and twisting to fasten the bayonet. The release is also unchanged; a sliding button on the left side of the camera body. The AF mount is compatible, in a limited way, with the lenses for the preceding models (the Mamiya M645 and M645 Super/Pro series cameras). The manual-focus lenses can be fitted to the new mount, but the AF cameras do not have the pin to mate with the aperture yoke on these lenses, so stopped-down metering must be used. There is also a special focusing screen, with a manual-focusing aid (a microprism/rangefinder spot) for use with manual lenses. Mamiya produce a mount adapter allowing the use of Hasselblad V series lenses. These are subject to similar limitations, needing the manual-focus screen and stopped-down metering. The 645 AFD is very similar to the AF, except for the addition of Mamiya Serial Communication software to communicate with a digital back, if fitted, and display information about its state in the camera's LCD. This information is quite basic, showing when image capture or storage is in progress, the remaining capacity of the back's storage, and when this or the back's battery are exhausted. The 645 AFDII is similar to the AFD. Mamiya's literature mentions a new, quieter focusing motor and a new 'focusing algorithm'. The camera body has a few additional or changed features, but the most significant changes are in the software. The mirror lock is now electronically activated, with a button by the mode dial (where the mode button was on the AF and AFD), instead of the manual mirror-up lever. By default, the mirror lock is cancelled after each exposure; however, this and many other default behaviours are adjustable via custom settings (see below). There is an 'auto-focus lock' (AFL) button, below the infra-red focus-assist lamp. When pressed, this prevents the camera from continuing to re-focus, in the Continuous AF mode. Again, the extensive menu of custom settings allows the functions of this button and the AE lock button to be swapped. The increment for all exposure variations can be set to one half or one third of a stop. The auto-focus can be set to use a smaller central area of the scene. Custom functions replace the 'T' mode, and extend the range of long shutter speeds (see below). The infra-red focus-assist lamp can be disabled (for reasons of discretion). 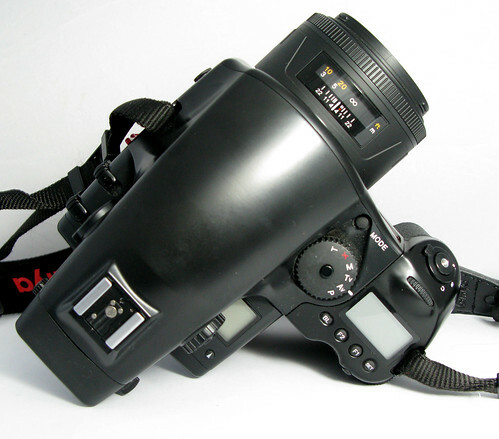 Display of the focusing guides and focus marker in the viewfinder can be switched off. There is no longer a 'T' position on the mode dial (for very long exposures). These can still be achieved, of course, by setting the shutter speed to 'B' in 'M' mode, and using a locking cable release. Alternatively, a custom function allows the behaviour of the 'B' setting to be selected as a conventional 'B' (shutter remains open as long as the release is pressed) or 'T' shutter (release pressed once to open the shutter, and again to close it). Another custom function allows a maximum opening time to be assigned to the 'B' setting, after which the shutter will close, regardless of the shutter release. This can be up to 60 minutes. However, whereas the 'T' mode of previous models was mechanically controlled, 'B' is electronic, and will drain the batteries. There is now a straightforward self-timer position on the shutter release control (the self-timer was accessed as the third option with the mode button on the previous models). 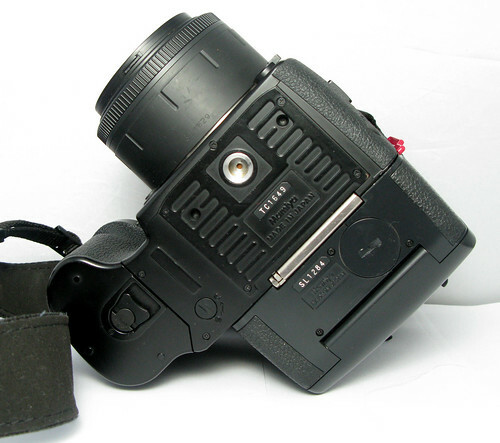 The auto-focus mode switch is repeated on the barrels of some of the lenses available when the AFDII was produced. Also, on some of the zoom and telephoto lenses, auto-focus can be switched on and off using the focus ring itself. There is another significant change to the software regarding the 'program shift' function in 'P' mode. Rather than a one-stop shift in each direction, this function now selects the highest shutter speed possible (PH), or the smallest possible aperture (PL), for a given metered EV value. As with other features, there is some scope to adjust the behaviour of the program shift using the custom settings. The mirror lock function is now given a position on the shutter release lock (where the self-timer was on the AFDII) and the self-timer is accessed using the button that was the mirror lock. A custom function allows a mirror-up delay to be set, such that when the shutter release is pressed, the mirror is raised, and the shutter then released after a short delay, to allow camera vibrations to cease; a very sensible combination of functions. The camera normally uses the same auto-focus area; a shallow rectangle across the centre circle of the frame. As with the AFDII, there is a 'spot' focus option, but now any of three focus spots may be selected (one in the centre of the circle, one at the left-hand end of the normal area, and one to the right), and the user may select which of these the AF system uses. There is an auto setting in which the camera focuses using whichever of the three focus spots has the closest subject. In fact, the three spots are rather too close together for this feature to be useful. A new film holder (model HM402) was produced for the AFDIII; this allows faster film transport (with both the AFDIII and the AFDII) and also allows the AFDIII to imprint extra data (the lens focal length) on the margin of the film. The two film holder models are compatible, to the extent that the inner parts can be interchanged, but data imprint may be affected, especially at fast shutter speeds. The AFDIII can accept Ni-Cd or Ni-MH batteries, in addition to alkaline or lithium batteries. 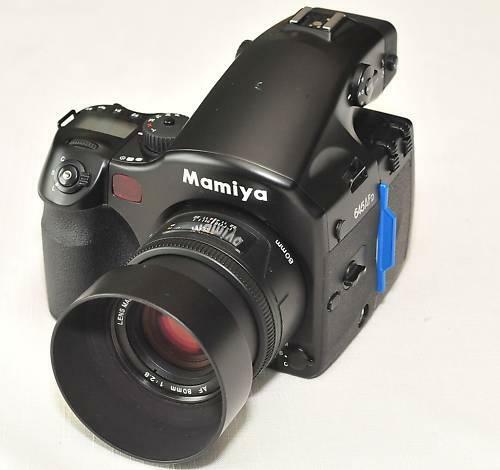 Mamiya marketed the 645 AFDIII with the 22-megapixel ZD back., but other makers' backs, including Leaf and Phase One, can be used. Mamiya has since gone into close partnership with Phase One. The Phase One 645 AF is essentially identical to the Mamiya 645 AFDIII. A digital-only camera body of very similar specification, the 645 DF is sold under both the Mamiya brand, with their DM series of digital backs (22 to 33 MP) and with the Phase One brand, with backs up to 60 MP. ↑ Mamiya company history (archived), in Japanese, on the Mamiya Digital Imaging website. ↑ 2.0 2.1 2.2 Shown in the brochure for the AFDIII, formerly available at the Mamiya USA site. ↑ 3.0 3.1 With Ultra-Low Dispersion glass. This page was last edited on 26 February 2018, at 11:28.